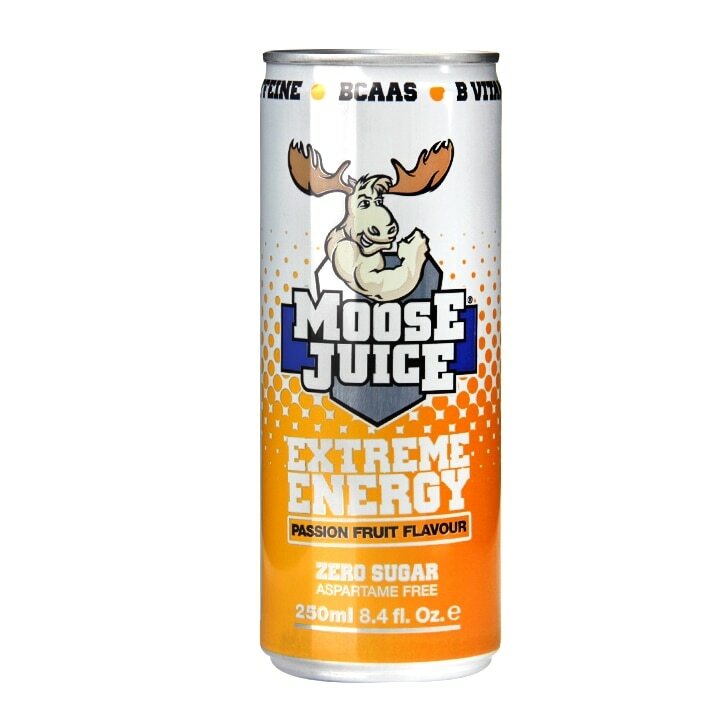 Moose Juice Extreme Energy is a seriously strong energy drink which comes in a tasty passionfruit flavour. Zero sugar, aspartame free with BCAAs and B-Vitamins. You must be 16 years or older to purchase this product. Once opened, consume within 48 hours. Carbonated Water, D-Glucuronolactone, Branch Chain Amino Acids (Leucine, Isoleucine, Valine), Taurine, Caffeine Anhydrous, L-Tyrosine, L-Carnitine, L-Tartrate, Pyridoxine Hydrochloride (Vitamin B6), Nicotinamide (Niacin), Choline Bitartate, Cyanocobalomin (Vitamin B12), Folic Acid, Flavouring(s), Acidity Regulators (Malic Acid, Citric Acid), Sweeteners (Sucralose, Acesulfame Potassium). Long term intakes of >10mg of vitamin B6 may lead to mild tingling and numbness. High caffeine content. Not recommended for children or pregnant or breast-feeding women. (40mg per 100ml). Consume responsibly – a maximum of 2 cans per day. Moose Juice Passion Fruit is rated 4.7 out of 5 by 3. Rated 5 out of 5 by Croydons finest from Moose tastic! Now..iam energy drink addict I drink about 3-4 boost a day or 2 monsters or 3 relentless a day just to keep me going or should I say satisfy my craving for a pick me up, so whilst browsing in my local H&B I came across this can that said EXTREME ENERGY so I purchased a can. Next morning I thought I’d try this just to wake me up and by gosh did the moose kick me! Not only did I jump out of bed but I did things I don’t normally do like prepare dinner for the evening at 7am!!! I will NEVER I repeat NEVER be going back to those bog standard energy drinks again!